I have been beading for 10 years. 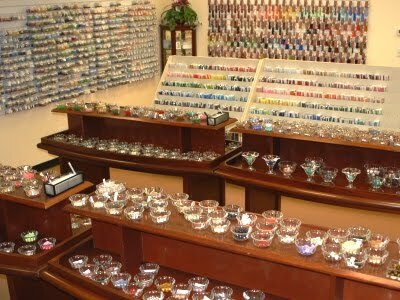 In my travels, I have visited every local bead shop (LBS) I can find. Why? Because I love beads and beading supplies, and every shop has its own unique personality and local charm. This hasn't changed just because I run my own bead shop, either. 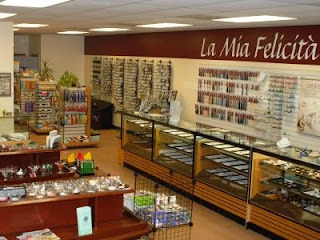 Today I want to let you know about La Mia Felicita in Plaistow, NH. This shop has been in business for over 4 years. The owner, Cathy Tedesco, is friendly and fun. Tell her I sent you over! The store is located 3-4 miles off of the highway in a strip mall seemingly in the middle of nowhere. Once you enter this bead oasis, though, any thoughts of a strip mall will disappear. This is truly a "bead boutique". The shop carries a lot of glass, stone, Swarovski, and books. And the seed beads...!! HOLY MOLEY. This shop carries the Toho line, so you will see some different colors than you usually see at most bead shops. 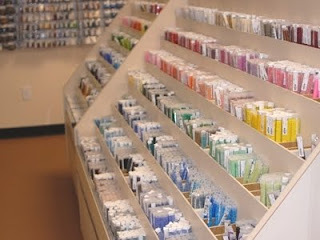 (Most bead shops, including my own, carry Miyuki seed beads.) Any of you bead weavers will be overjoyed at the size and color selection. I definitely recommend taking the drive to Plaistow. It's about 25-30 minutes from Lowell, and less than an hour from Boston. My friend Donna and I always make the pilgrimage when she visits from GA. Sometimes I go shopping -without- my friend Donna - we'll talk about that in my next installment.